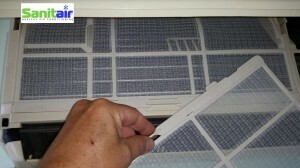 Regular cleaning of your air conditioner filters or even washing them with anitbacterial solution does assist in the cleanliness, but contaminants such as mould and bacteria will immediately return. It can take as little as 3 months for mould to start to regrow on your air conditioning evaporator coils if not treated correctly. 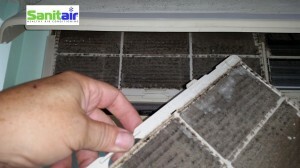 Sanitair Certified Technicians will strip clean your air conditioning system removing all visible contamination from the filters, evaporator coils, condensate drain pan, louvre and return air vent. Sanitair uses advanced cleaning and sanitisation products that are environmentally friendly, bio degradable and non toxic. Sanitair can supply and apply a range of products that can provide you with ongoing indoor coil protection from bacterial contamination for up to 12 months depending on your health requirements and budget.